This is Z Life: We Have a Winner! Top row, left to right, standing: Susan Brockinton Zimmerman (yours truly), several have confirmed what I thought about the next girl whom I did not include in the contest because I was unsure of her identity - it's Cindy Haney, then Doug Smith, and Kitty Ott. 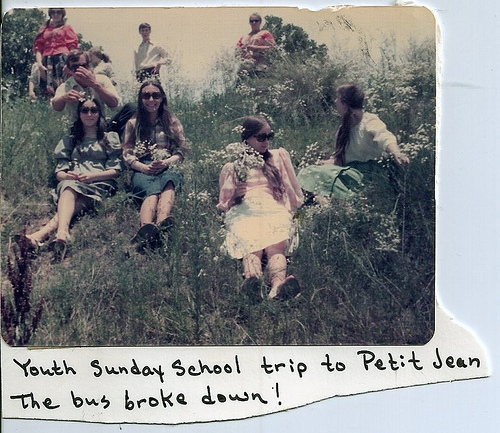 Seated in the grass: The young man with his hand over his face is Dewayne Seigrist, the young ladies are Karen Dollar Gibson, Margaret Davis Echols, Faith Holmes Cavin, and Rachel Haney Smith. Thanks to those of you who participated! Eva has asked that I donate the giftcard to someone, and I have already selected that person. She is a very special friend of mine. Can anyone guess the identity of the lady in the blue dress in the second picture? Yes, Lisa, that's my darling Mother. She was about a year younger than I am now. She was so full of life! You can tell she was having a good time! She was a wonderful example of a lady and a Christian! I am glad I knew her! Happy Valentine Birthday #26, John!